John Zaffis has over forty years of experience studying and investigating the paranormal. He has had the opportunity to work for and with his aunt and uncle, Ed and Lorraine Warren. This sent John beyond looking for ghosts and hauntings and into studying demonology under the Warrens. This led into John's involvement with cases of possession and exorcism, which gave him the opportunity to work with prominent exorcists in this field, including Roman Catholic priests, monks, Buddhists, rabbis and ministers. John has assisted and worked with well-known exorcists Bishop Robert McKenna, Father Malachi Martin, Father Larry Elward, Jose Antonio Fortea and the Reverend Jun. His research has taken him throughout the United States, Canada, England and Scotland covering several thousands of cases. Through hands on investigating with other investigators and clergy, he has obtained a great deal of knowledge and understanding of the paranormal and is considered one of the foremost authorities in the field today. John has a lot of first-hand paranormal experience, including experience with ghosts, poltergeists, and demonic and diabolical entities. He has also worked extensively with both spiritualists and psychics concerning how their knowledge is used for channeling, reincarnation (past-life regression), calling of the spirits for information, and how they use meditation to acquire the information which they are seeking. Because of his personal experiences with hauntings, ESP, near death experiences and other paranormal activities, he is firm in his conviction that such phenomena exist. John has been featured in the Discovery Channel's documentaries A Haunting in Connecticut and Little Lost Souls. John has also appeared on Unsolved Mysteries, Fox News Live, and many other print and news media events. John also appears in Graveyards and In A Dark Place, both books written by Ed and Lorraine Warren. John's first book, Shadows of the Dark, co-written with Brian McIntyre, was released in September, 2004. A documentary on John's work in the field The world Within was released in 2010. 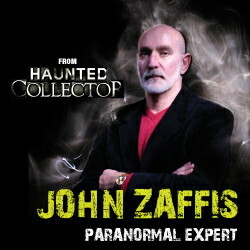 John hosted a show on SyFy, Haunted Collector, and became a producer for the last season of the show. John has also appeared on Ghost Hunters and Ghost Adventures. John is working on multiple follow-up books currently, and is lecturing all over the United States at colleges and universities. Over the years, John has collected many hundreds of possessed items either given to or sent to him by people wishing to be rid of them. The John Zaffis Paranormal Museum opened in 2004 in order to display these items, and continues to be open today.John's book Haunted by the things you love co-written with Rosemary Ellen Guiley was released in August, 2014. John wrote and starred in the documentary film Museum of the Paranormal, released in 2010, which gives the viewer a tour of his museum and the stories behind some of the objects.